Warmer days are here again, and I couldn't be happier. With only a month left of school, we are already getting into summer-mode at home, making the most of our evenings with bike rides, soccer games, and swimming. This season, it's all about making the most of our time outside—and hosting friends and family for backyard BBQ's. Tis the season, after all. If you're not sure what to serve, perhaps start with a wine menu to set the tone and select the food after you've figured out the drinks. Think pink! E&J Gallo White Zinfandel is an excellent choice. This refreshingly sweet wine is even yummier when you mix it with soda water, and garnish it with fresh berries. It's a perfect spring cocktail to enjoy in the sunshine, and a beautiful drink to serve your guests as they arrive. Get your grill on. With grilling season upon us, having a delicious red wine like Alamos Malbec is a must for your wine rack—this red from Argentina has easily become one of my favourite red wines. It's not too heavy, and pairs well with food you're serving on the BBQ. (Try it with grilled burgers and rib-eye steak—delicious!). Drink your dessert. I don't know about you, but I definitely try to skip heavy dessert when I'm in my bikini! Instead of serving a traditional dessert, end your meal with a glass of chilled Barefoot Moscato. This wine goes well with fresh fruit (my favourite summertime dessert) and cream for a simple and delicious treat. Warm days, cool drinks. If you're too hot for red, go with white. A light, delicious white wine I love is Whitehaven Sauvignon Blanc—a must for spring and summer. This is a dry, crisp wine from New Zealand, and pairs nicely with grilled fish and salads. The perfect white wine to sip as days get longer and warmer. Cheers! There is always a reason to celebrate, so you should always have a delicious bottle of La Marca Prosecco ready to toast for those everyday moments worth celebrating. (Last day of school, upcoming vacation, work milestone, birthday, anniversary, girls night... you get the idea!). This Prosecco from Italy is a nice drink to enjoy along with some salty foods, like nuts or kettle chips. Simple elegance. 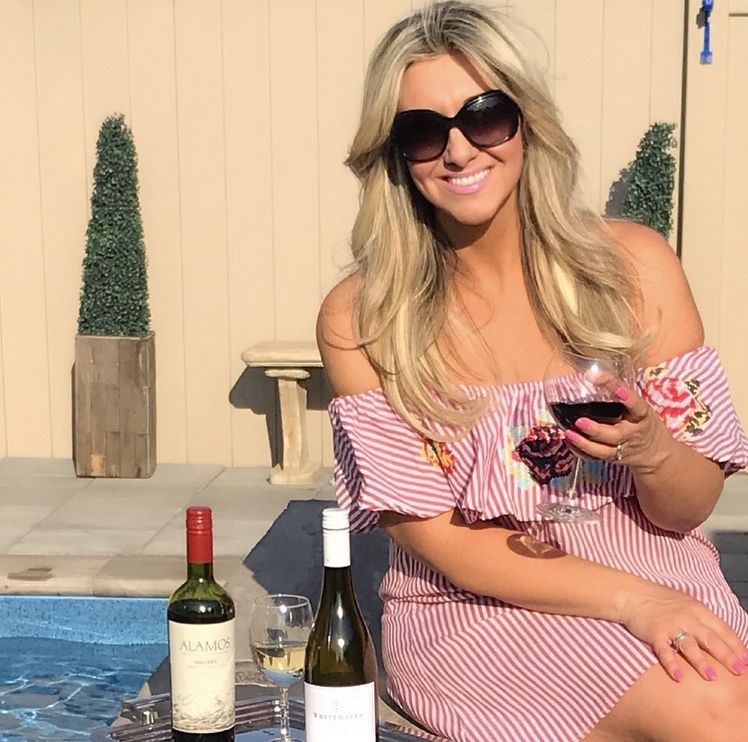 Although spring and summer makes me think cheerful and light, a more premium wine like Louis M. Martini Cabernet Sauvignon from Sonoma County is an elegant choice to serve at your dinner parties this season. It's a beautifully balanced wine with dark fruit and a flourish of spice that pairs nicely with pasta dishes. However you're celebrating this season, enjoy—and cheers to warmer days and summer nights with the people you love. Disclaimer: I received bottles of wine to review for my post. All views and opinions are my own.